Maxance, who just turned 14, asked his parents for an $800 pair of Adidas shoes for his birthday. He did not get them. "We live in a world where sneakers are basically works of art," the teenager said. The world is also one in which luxury sneakers - often limited-edition collaborations between the big names in sportswear and fashion labels, rappers or famous athletes - have become coveted accessory for everyone from tween boys to middle-aged men. Some pairs fetch tens of thousands of dollars - the super-rare Derek Jeter Air Jordan 11, named for the New York Yankees superstar, were going for about $50,000 in recent weeks. Only five pairs were released. Such shoes are bought second- or third-hand, mainly on the internet but also in chic boutiques or pop-up stores, packaged in plastic wrap to protect them. New York is one of the capitals of this flourishing high-end sneaker culture, though the trade in trainers is hardly new. It began in the 1990s - when Nike made it big with the first Air Jordans, made for the legendary basketball star Michael Jordan, those shoes quickly became must-have collector's items. Then in the 2000s, the market grew as the internet boomed, especially on auction sites like eBay. Just part of the market? Today, boosted by celebrities, social media influencers and the mainstream influence of rap culture, the sneaker biz has gone global. It's particularly big in the United States, Europe and Asia. Since 2016, it even has its own "stock exchange" - the StockX website. 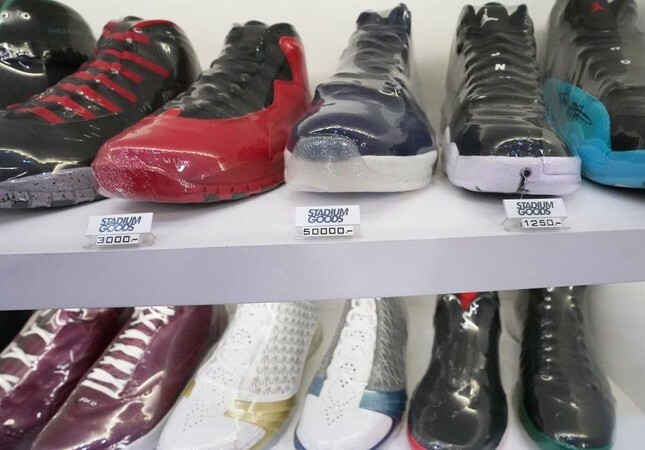 Matt Powell, a sports industry analyst for the NPD Group, says the actual size of the luxury sneaker market is hard to estimate, but one thing is clear - "that market has had nice growth." Even if it's centered on a few key industry players, the market is fed by a mass of small-time vendors -many of them sneaker addicts themselves looking for a quick way to make extra cash. But for John McPheters, the president and co-founder of Stadium Goods - mainly a web business, but which opened what has become one of New York's most popular sneaker stores in Soho in late 2015 - these estimates are way too low. Stadium Goods sold more than $100 million in shoes last year, McPheters says. And sales have at least doubled this year, in what he says is a healthier market now that certificates of authenticity have become the norm. The future plans of McPheters and Stadium Goods are a good indication of the luxury sneaker market's potential and worldwide appeal. While internet sales account for 90 percent of the firm's total for now, they plan to open several more actual stores in the US and abroad. China is its largest market outside the US, followed by Britain and Canada, McPheters explains. Thanks to a partnership with Britain-based online fashion platform FarFetch, Stadium Goods is hoping to soon break into the Russian market.